Go to any pet shop and you are likely to see many water treatment products. Making sense of which ones you need, as well as when and how to use them, can be somewhat daunting. This water treatment primer covers the major types of water treatment products, including what they are used for and best practices for aquarium water treatment. Sooner or later algae occurs in most aquariums. A small amount of algae growth is not harmful, and is desirable if there are algae eating fish in the tank. If the algae growth becomes excessive, it can be harmful to live plants, and possibly even the fish. Even if it is not harmful, it is unsightly and detracts from the beauty of the aquarium. The root causes for algae overgrowth lie within one of the three factors algae requires for growth: water, light, and nutrients. Before treating your aquarium for algae, it's important to determine what the underling cause is. This aquarium algae primer describes each source, how to treat according, and includes preventative measures to help avoid future algae overgrowth. A word of caution - before using chemical treatments, keep in mind that if algae growth is not severe, manually removing it and performing regular aquarium maintenance is your best approach to managing algae issues. Use of chemical treatments for any aquarium problem should be considered carefully, because the side effects can cause more problems than they solve. Elevated ammonia is a problem that always should be addressed promptly. Failure to do so can result in fish death, or damage to their health. 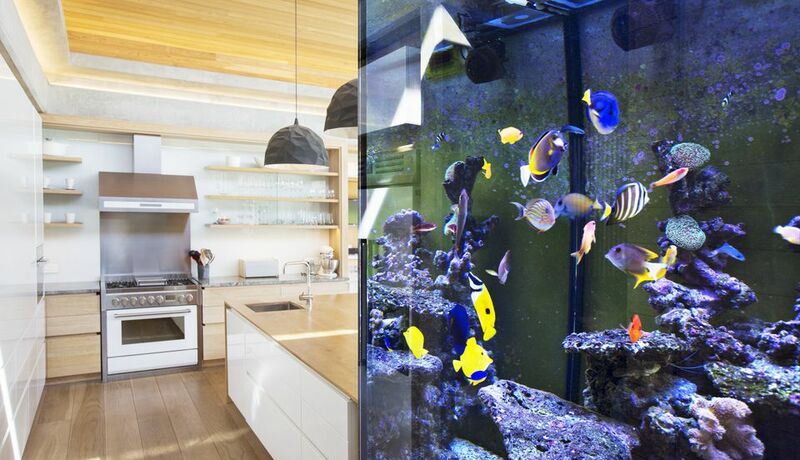 Every new aquarium will go through a process sometimes referred to as the break-in cycle. During that time, biological colonies that convert harmful toxins, quickly begin growing. However, until those colonies grow sufficiently to convert of all the ammonia in the tank, the fish are at risk. During that time, it is critical that water tests be performed regularly to determine the level of ammonia in the tank. If the ammonia reaches dangerous levels, steps must be taken to quickly reduce it. Water changes will help, but if the ammonia is extremely high, an ammonia binder should be used to bring ammonia down. Ammonia binders are available in a liquid form, or in the form of filtration media. For rapid reduction of critically high ammonia, use a liquid binder. Filter media form is useful when levels are elevated, but not immediately critical. A newly set up aquarium is not the only situation in which ammonia can become elevated. If fish die and are not promptly removed, or the filter fails for a period of time, or if the tank is not maintained well, ammonia levels can rise. Regular water testing will help detect ammonia spikes. Anytime something happens, such as a prolonged power outage, or sudden fish death, I recommend testing for ammonia immediately, then again several days later. If ammonia is detected, continue testing daily until the ammonia drops. If the ammonia rises to potentially harmful levels, take action to lower it. Freshwater aquariums often can benefit from the use of small quantities of salt. This is particularly true in a newly set up aquarium that will go through a period of elevated nitrite. Salt can help avoid the effects of nitrite poisoning. Generally speaking, salt aids in the healing of minor skin irritations, and improves respiratory function in fish. However, salt also has a down side. Scaleless fish, such as many in the catfish family, do not tolerate salt well. Live plants are also fairly intolerant of salt. Before using salt, consult the salt in freshwater article for best practices and dosing methods. A large part of maintaining a health aquarium environment is establishing and promoting stable colonies of beneficial bacteria. Several products are available that are designed to promote healthy biological colony growth. It is important to understand that these colonies do not instantly grow and reach stable levels. Even when using biological aids, it will take some time to reach a stable balance. During the time these colonies are growing and reaching stable proportions, testing the water regularly, and taking steps to address elevated ammonia or nitrite is important. pH is an important parameter to consider when keeping an aquarium. Although most fish will do okay in a tank with a neutral pH, each species has a pH range that they thrive in. Many Tetras prefer a lower pH, while most cichlids favor a higher pH. Live plants also thrive in a certain pH range, which should be considered when keeping plants. Generally speaking, it is wise to use source water that is already in the pH range you desire, rather than trying to modify the pH on an ongoing basis. However, there are times when it is necessary to alter the pH. Lowering the pH is best achieved by using filtered water that is low in mineral content. Blackwater treatments will lower pH and soften the water, but if the source water has a high buffering capacity, the pH will rise again. Using filtered water that is has a low buffering capacity will ensure the pH remains stable in the lower range you desire. Raising the pH requires the opposite strategy, increasing the buffering capacity of the water. While products such as pH UP may temporarily raise the pH, keeping it there is the problem. When attempting to raise the pH in a freshwater aquarium, always use a method that increases the buffering. Crushed coral is an excellent means for accomplishing this. Buffering additives together with a pH adjusting product will work as well. The key to any pH change is to avoid a sudden change that will not remain stable. Frequent pH changes do more harm than a pH that is slightly off from the optimal range. Phosphates (PO4) are present in all aquariums, even well maintained ones. Over time, phosphate levels tend to creep up,particularly if there are no live plants in the tank. Fish waste, uneaten food, and in some cases even the water source itself will contribute to phosphate creep. If regular water changes aren't performed, phosphate levels will eventually promote algae overgrowth. If you are battling algae, odds are the phosphate levels in the water are elevated. A will help you know if phosphate is adding to your alga problem. At levels of 1.0 ppm (or 1.0 mg/L), the conditions become favorable for algae growth to start. At 2 to3 ppm, algae overgrowth is likely to occur. Ideally phosphate levels should be kept at 0.05 pmm, or below. phosphate water test When phosphates are elevated, water changes and tank maintenance will help reduce them. The use of phosphate reducing products such as specialized filter media, or phosphate control additives will help bring phosphate levels down and reduce algae growth. Virtually everyone will use some type of treatment for the water they fill their aquarium with. If you use tap water, you must treat it before using it in an aquarium. This is even true if you age your tap water, as aging doesn't always eliminate all potentially toxic substances. In addition to chlorine and chloramine, heavy metals can be a problem as well. Water conditioners will neutralize all of those. Most tap water conditioners also contain an agent to support the slime coat of your fish, which is important when fish are stressed. Even though you may not think so, every time you change water, perform maintenance, or make any changes in the aquarium, it stresses the fish. Although it may be only a mild stress, it can affect the health of your fish. A number of water conditioners also include an agent to convert ammonia to the non-toxic ammonium. Some will also advertise that they neutralize nitrite and nitrate. However, none of them can do that instantly. The best they can do is promote the biologicals that are part of the nitrogen cycle. Given time, those biologicals will break down toxins, but it won't happen immediately. Over time, aquarium water can become somewhat cloudy due to fine particles of algae, dirt, silt, fine sand, and other debris. These particles are too fine to be removed by the filter media, and can cause the water to be hazy. Products sometimes referred to as flocculants, are designed to help remove those fine particulate matter from the water. Flocculants, or water clarifiers, cause the fine particles to clump together into aggregates that are large enough to be filtered out, or heavy enough that they fall to the bottom of the tank where they can be vacuumed out. Most water clarifiers are safe for all tanks, but read product descriptions carefully and follow dosing instructions closely to ensure the safety of your fish and live plants.